The soft sandstone cliffs of Sego Canyon feature some of the most spectacular examples of rock art in the Southwest and are attributed to the Archaic people. Archaic people were nomads, hunting large and small game animals, collecting and processing wild plants. They did not build permanent habitation structures, but lived in caves and in small brush shelters built in the open. They occupied this area from approximately 8,000 years ago until the introduction of corn agriculture about 2,000 years ago. 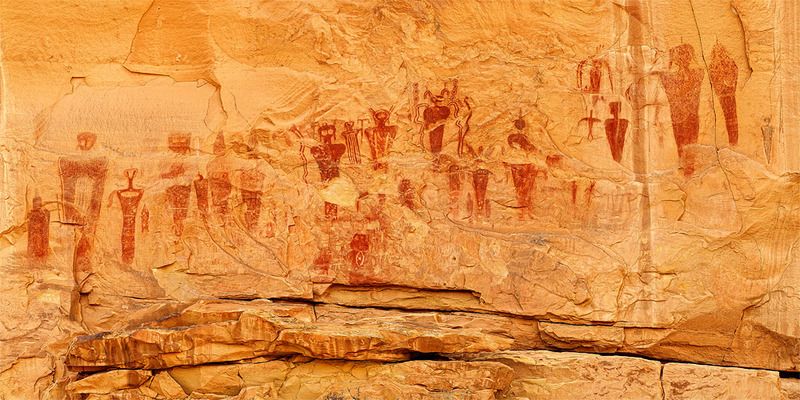 These Native Americans painted and chipped their religious visions, clan symbols, and records of events onto the cliffs. There are three distinct styles present which represent three separate cultures and time periods. These cultures are known to have been in the area during the past several thousand years. These alien looking figures stained and carved into the rock face are life size, some nearly 5-6 feet in size.